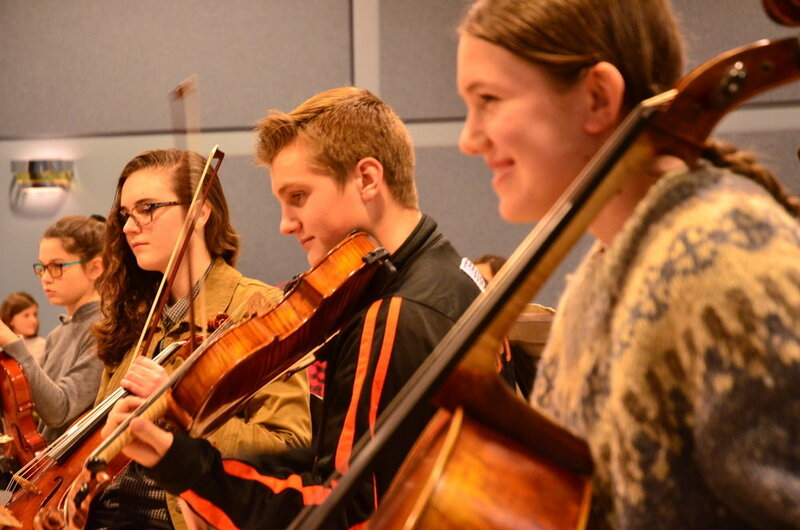 Under the musical direction of Uli Speth and Debrah Devine, LDYE and LDYE Preparatory Orchestra rehearse once a week in Oneonta during the school year and perform three public concerts each year. In addition, each year LDYE sponsors a two-day workshop featuring hands-on teaching by leading performers from the worlds of classical, jazz, rock, bluegrass and klezmer. Each one of these annual workshops brings together more than 500 student musicians from elementary and high schools throughout central New York. Recent workshops have included the participation of pioneering rock violinist Mark Wood; Berklee cellist Eugene Friesen; renowned bluegrass group Uncommon Ground; international traditional fiddling champion Ivonne Hernandez; and noted British jazz violinist Ben Powell. Interested young musicians are invited to observe rehearsals, participate in workshops and attend performances. Check the event calendar or contact us for clarification. All members of the community are encouraged to attend our free performances. Rehearsals occur every Monday 4:30 to 6:30 during the Fall and Spring Semesters, excluding holidays and some school breaks. Check here for a print version of the schedule, or check the site calendar. LDYE operates largely on support from public grants, foundations and private donations, in addition to a modest tuition. If you would like to support LDYE financially, see our Support page or simply donate here directly through the site. Your email will be used by LDYE only and will not shared with any other party. Thank you! We will keep you informed about upcoming events. Please share with others. Participation in LDYE fosters ensemble, improvisational and performance skills. The Little Delaware Youth Ensemble meets weekly (Modays from 4:30 to 6:30 at the Foothills Performing Arts Center) to rehearse ensemble works under the direction of Uli Speth. The LDYE Preparatory Orchestra meets at the same time and location, but rehearses separately under the direction of Debrah Devine. At least once annually, LDYE hosts a workshop. Workshops are led by prominent musicians from around the country who work in diverse musical genres. These workshops are attended by LDYE students and area students are strongly encouraged to attend, regardless of any affiliation with LDYE. Workshops are free to students and also involve a free concert for the general public. At the end of each semester during the school year, LDYE offers free concerts for the general public. It is an excellent opportunity to gain experience with public performance and to connect to the musical community of which LDYE is a part.